A few years ago when my father still took care of the garden, we had a great field of pumpkins with many varieties, some of which came from Argentina. To satisfy my curiosity, seeds were brought from my aunt who lives in Rosario. My father was very committed to growing good fruit and therefore, in August of that year our pumpkin field was really fantastic, with the most exemplary pumpkins I’ve ever seen. Since we had so many pumpkins, I tried to use them in numerious ways and often invited someone to share my experiments. Among them was Paolo, a dear architect friend who always came to dinner with some cookbooks or essays illustrating the use and the various properties of pumpkins. For a long time he encouraged me to write a book on this topic, offering to make the illustrations. Because I was so busy with other things, I could never materialize his encouragements. However, the amount of reading I did on the subject has enriched my knowledge on pumpkin. The dish that I propose is a variant on a recipe found in the “The Pumpkin” by Paolo Morandi and Chiara Nardo. This recipe has no added fat. 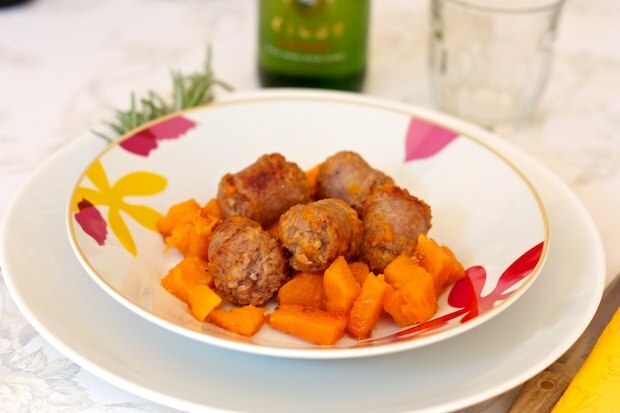 Cut each sausage into three pieces then cut the pumpkin into small pieces. Add the pumpkin to a pan with the rosemary and shallots that have been sliced thinly. Turn on the burner and after one minute, pour ½ cup of white wine. Cover the pan with a lid and cook for about ten minutes. Check occasionally to see that the pumpkin does not stick. Once the pumpkin is cooked, remove the pieces from the pan and put them aside on a plate. Remove the rosemary branch. Add the sausage to the pan and cook over high heat, stirring frequently. After two or three minutes, add the remaining wine and cook until the sausage pieces are browned. Now add the pumpkin back to the pan and cook together for a minute. Serve hot on individual plates. Posted in Meat and tagged with Pumpkin and Sausage, Zucca e Salsiccia. RSS 2.0 feed.